Caution! The 4027 IC is CMOS, and therefore sensitive to static electricity! Lessons In Electric Circuits, Volume 4, chapter 11: "Counters"
In a sense, this circuit "cheats" by using only two J-K flip-flops to make a three-bit binary counter. Ordinarily, three flip-flops would be used -- one for each binary bit -- but in this case we can use the clock pulse (555 timer output) as a bit of its own. When you build this circuit, you will find that it is a "down" counter. That is, its count sequence goes from 111 to 110 to 101 to 100 to 011 to 010 to 001 to 000 and then back to 111. While it is possible to construct an "up" counter using J-K flip-flops, this would require additional components and introduce more complexity into the circuit. 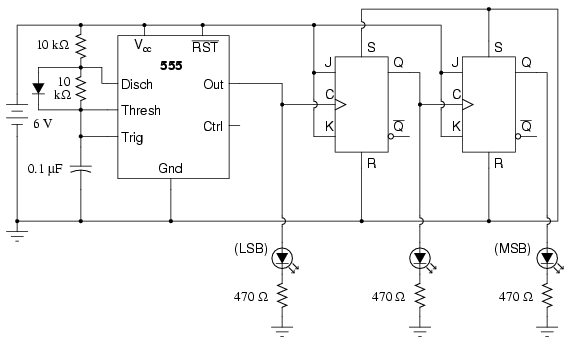 The 555 timer operates as a slow, square-wave oscillator with a duty cycle of approximately 50 percent. This duty cycle is made possible by the use of a diode to "bypass" the lower resistor during the capacitor's charging cycle, so that the charging time constant is only RC and not 2RC as it would be without the diode in place. It is highly recommended, in this experiment as in all experiments, to build the circuit in stages: identify portions of the circuit with specific functions, and build those portions one at a time, testing each one and verifying its performance before building the next. A very common mistake of new electronics students is to build an entire circuit at once without testing sections of it during the construction process, and then be faced with the possibility of several problems simultaneously when it comes time to finally apply power to it. Remember that a small amount of extra attention paid to detail near the beginning of a project is worth an enormous amount of troubleshooting work near the end! Students who make the mistake of not testing circuit portions before attempting to operate the entire circuit often (falsely) think that the time it would take to test those sections is not worth it, and then spend days trying to figure out what the problem(s) might be with their experiment. Following this philosophy, build the 555 timer circuit first, before even plugging the 4027 IC into the breadboard. Connect the 555's output (pin #3) to the "Least Significant Bit" (LSB) LED, so that you have visual indication of its status. Make sure that the output oscillates in a slow, square-wave pattern (LED is "lit" for about as long as it is "off" in a cycle), and that it is a reliable signal (no erratic behavior, no unexplained pauses). If the 555 timer is not working properly, neither will the rest of the counter circuit! Once the timer circuit has been proven good, proceed to plug the 4027 IC into the breadboard and complete the rest of the necessary connections between it, the 555 timer circuit, and the LED assembly.